Comparing the calculation of fluid flow in real life biological systems. Students will gain experience using Torricelli’s Law, building their own water bottle experiments, and applying their observation to urinary systems inside mammalian bodies. No calculus will be used in this lesson, but familiarity with speed and flow rates is suggested. The lesson will take about an hour to complete. Students should prepare plastic bottles, plastic pipes, hot glue, a timer, and a calculator and, if possible, close access to water for the activities. The activities involve draining out water, so students might get wet. Between lessons, it is recommended that students discuss the experiment and calculations with their neighbors. 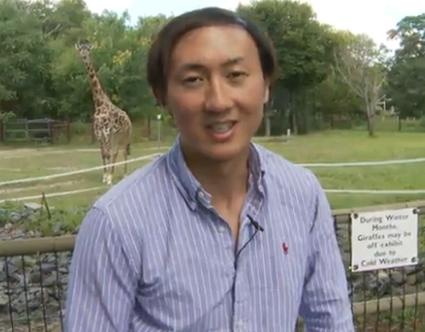 Dr. David Hu is a mechanical engineer who studies the movement of animals. He is particularly interested in how animals use specialized surfaces such as water-repellent fur and snakeskin. David has studied how snakes slither, how insects walk on water, and how small insects fly in the rain. Videos and images used in our work may be found on his website. Patrica Yang is a graduate student who studies fluid transportation in the body. She has been studying the fluid mechanics of urination, defecation and digestion. Her dream is to continue work with animals as a professional scientist. This is a Wikipedia site explaining Torricelli’s Law. This site, sponsored by the Wolfram Demonstration Project, presents a demonstration of Torricelli’s Law. This is a video produced by the Science Friday team of Professor David Hu discussing his research on mammalian urinary systems.